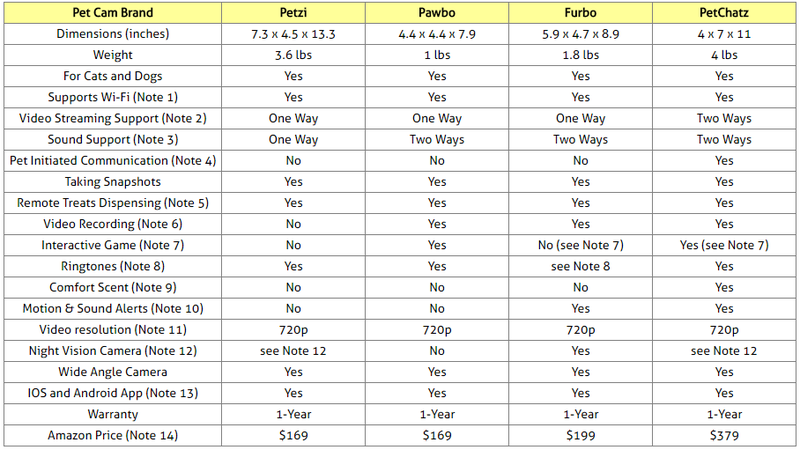 Compare Wi-Fi Pet Cameras and Treat Dispensers: Petzi, Pawbo, Furbo or PetChatz? Do you worry about your dog when you have to spend a lot of time at work having to leave him (or her) alone at home? Do you worry about your cat when you're traveling and you have to leave him (or her) with friends or family? Well, you don't need too worry any more! A Wi-Fi supporting pet camera that enables communication with your pet from wherever you may be is probably what you should be considering. These cams allow you to connect from anywhere so you can be there with your pet even when you can’t be physically there. The apps that are provided with these cams make it very easy to check-in and interact with your pet from any smartphone or tablet. Some brands even allow also using your desktop computer or laptop for communication. You can see, speak, snap a photo, record a video, and even treat your pet when you are away from home. Of course, you can use these cams not just to communicate with your pet, but with your family members as well. An iOS or Android app that allows you to control the camera and allows content to be shared socially. A remote treat dispensing system. Wide-angle camera with night vision. High-quality audio and video (note that not all brands provide two-way video and two-way sound communication). Snapshot taking and video recording. ​Note that you need to have high-speed Internet to have the best connection. Otherwise, you might get choppy video and audio. Also, if the camera you'll be getting does not support night vision, it definitely helps to have it in a well-lit room. This article will compare Petzi, Pawbo, Furbo and PetChatz Wi-Fi Pet Cameras and Treat Dispensers. These were not just the most popular among Amazon customers at the time this article was written, but they had also received excellent reviews from most Amazon buyers (an average of at least 4 stars each out of 5 stars!). All four cameras support Wi-Fi connectivity. As long as the camera is connected to Wi-Fi, your smartphone or tablet could be anywhere and connected either via Wi-Fi or 4G LTE. There is no screen on Petzi, Pawbo and Furbo for your pet to see you, but you can speak to them via the built-in speaker. On PetChatz there is a screen. So, your pet will see you on the unit, and you will see your pet on the smartphone, tablet or PC. With Petzi, your pet will hear you, but you won't hear the pet. Presently, there is no microphone on Petzi. With Pawbo, Furbo and PetChatz, your pet will hear you and you will hear your pet. Only PetChatz HD allows pet initiated communication. It is an optional feature available when using the PawCall optional accessory which is equipped with a little button that allows your pet to call you (PawCall can be obtained below in the Amazon products section). To properly use PawCall, you just need to place it near the PetChatz system. To let your pets know that they can call you, simply schedule call times in your PetChatz web app, which causes a paw-shaped light on the PawCall button to blink. Pets press the button to initiate a two-way call over PetChatz HD. All four pet cams are equipped with treat dispensing systems. Using their associated app, you can dispense treats remotely. Pawbo, Furbo and PetChatz allow video recordings.They can be downloaded to your smartphone and shared with family and friends. Pawbo has a built-in interactive dot chasing game you can play with your pet remotely using the Pawbo app (see image below). The optional PetChatz PawCall accessory not only allows your pet to call you, but it is also a "gaming device" for your pet: you can schedule "Call Mode" and “Game Mode” to engage and exercise your pet’s mind with custom light and touch puzzles with treat rewards (PawCall needs to be obtained separately, see Amazon products section below). Furbo does not have an explicit game, but it is uniquely designed to launch your dog's favorite treats into the air, making it more fun for your dog to chase after, almost like a game. Petzi, Pawbo and PetChatz use ringtones to catch your pet's attention and announce that you are there. ​Petzi comes with a single ringtone. Pawbo comes with six ringtones any of which can be selected as the current one. Furbo makes a high pitch noise, almost like a whistle, when dispensing treats to catch your pet’s attention. But you can also record your own calling voice/ringtone, whatever you wish. With PetChatz, you can provide your pet with a “scent of security” by dispensing a calming scent created specifically for PetChatz or create your own to give your pet a more personalized experience. Furbo's built-in microphone and advance intelligent sensor can tell barking from background noises, then automatically sends alerts to your smartphone. PetChatz cam owners also receive alerts and notifications when a sound or motion event occurs within range of the PetChatz unit. The motion sensor range is approximately 8 feet distance within a 54-degree angle from PetChatz. A 720p video (and a 720p monitor) is 1280 (wide) x 720 pixels (tall). That's more than twice the detail of standard definition video. Petzi has a night vision setting, so it can see in low light. Note however that this is not true infrared vision: it isn't going to see "body heat", but it can still see quite well in low light. PetChatz does not have an infrared mode either, but low-light capabilities will be introduced in a future release. 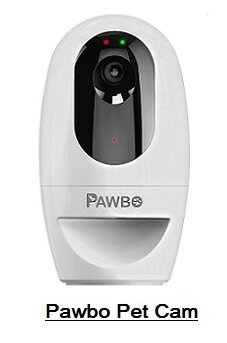 ​For now, Pawbo and PetChatz cameras should be placed in well lit rooms. With Furbo's night vision function, you can still see your dog in the dark. It has built-in infrared LED lights that let you see an incredibly clear view despite low-light conditions. All four cams provide the necessary applications (apps) that allow remote control of the cameras. Petzi, Pawbo and Furbo can only be controlled from a smartphone or tablet. They can not be controlled from a desktop computer or laptop. Both cameras support iOS and Android mobile devices. ​Two different users can simultaneously access these pet cams as long as they have the correct login credentials. PetChatz can be controlled both from mobile devices (smartphone or tablet) and from a desktop computer or laptop. Computer control is done from the www.PetChatz.com website. Both iOS and Android devices are supported (iOS 8.1.1 or later/Android 4.1 or later). Any number of friends and family members can access the PetChatz cam as long as they have the correct login credentials. So which of the four Pet Wi-Fi Treat Cams to buy? The four pet cams considered here are high quality products as shown by the average rating each had received from Amazon customers. Indeed, all four had received at least 4 stars (out of 5 stars) at the time this article was written. There is a good chance that you would be quite happy with any of these four products. 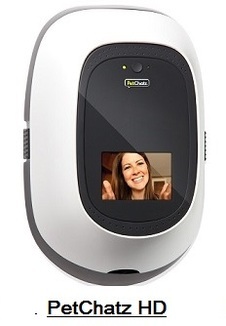 Only PetChatz provide two-way video communications and pet initiated connections (using the optional PawCall accessory). Only Pawbo and PetChatz have built-in interactive gaming to entertain your pet. Presently only Furbo supports true infrared technology and is best adapted to night vision. Only Furbo and PetChatz send alerts to your smartphone. Furbo detects barking and sends sound alerts, while PetChatz detects both motion and sound and sends appropriate alerts. You need to have high-speed Internet to have the best connection. Otherwise, you might get choppy video and audio. 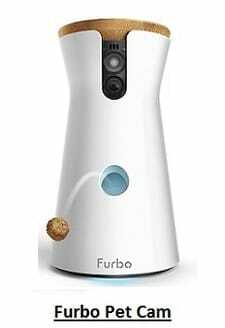 As only Furbo supports infrared night vision (and Petzi supports some night vision improvement functionality), the PetChatz and Pawbo cameras should be placed in a sufficiently well lit room. Please click the pet camera of your choice below for price information or to purchase. View live 1080p HD video with a 138˚ wide angle lens, night vision and 3x digital zoom. Chat and listen using 2-way audio. Play live games with your pet by swiping your finger across your phone’s screen or schedule autoplay mode to ensure your pet gets play and exercise. Capture and share photos and videos. Get sound & motion alerts for disturbances, and replay their activity on a video timeline so you know your pets and home are safe and secure. Share pet pictures and videos with friends, family and followers via the Petcube App, which integrates with leading social networks including Facebook, Instagram and Twitter. All users start with a free trial to Petcube Care, the video cloud recording service that stores your pet's activity history. After your free trial, choose the plan that works for you. All Petcube cameras work with Amazon Alexa (optional add-on feature), so you can use voice commands to activate autoplay games with your pet.